This being her birthday week and all, I think we need one more flashback to a Queen Margrethe classic. And if anything screams Daisy Style, this is it: big fabric, big sleeves, big skirt, big look. The outfit comes from the late Jørgen Bender, her favorite couturier. 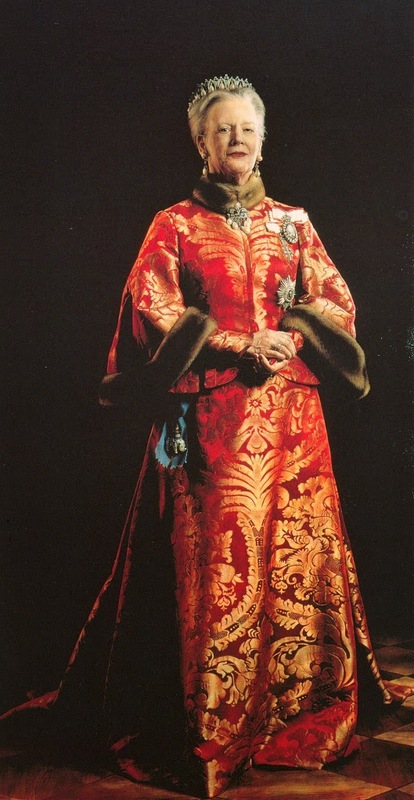 Bender was the go-to designer for Danish royal wedding dresses for many years, making Queen Margrethe's own wedding gown and those of her sisters, Queen Anne-Marie and Princess Benedikte, plus the gowns for Princess Alexandra of Sayn-Wittgenstein-Berleburg and Alexandra Manley (Prince Joachim's first wife, now the Countess of Frederiksborg, who also wore many of his clothes during her marriage). He was a favorite of Queen Ingrid's before becoming a favorite of Queen Margrethe, and thanks to Ingrid's guidance, he also dressed Queen Silvia of Sweden frequently. This was a designer that knew how to dress a queen, and today's outfit is the perfect example. I often joke that certain dresses look like sofas or drapes, but this is the rare case where that's actually true: Rubelli made the fabric, a company known for its high-end furnishing fabrics, and it's also used in the interior design of one of the palaces. The dress has a sweetheart neckline with full-length sleeves and a sweeping train at the back. The jacket has a slim-fit front, a cape-style back with wide sleeves at three-quarter length, and fur trim around the bottom and the neck. Obviously there are also shoes and a handbag made to match in the same fabric, because it wouldn't be a signature Margrethe look without them. For the wedding, she wore the Floral Aigrette Tiara and the set of rubies, diamonds, and pearls that belongs to the Danish crown jewels. Using the dress and jacket again for later official portraits, she used the Pearl Poire Tiara and the pearl and diamond jewels that are often worn with it (and I do prefer the pearl tiara with this, despite my deep love for her flexible floral diadem). The whole effect is intended to be rather Holbein-like, and fittingly, she also wore this for a very imperious portrait by Thomas Kluge (you may know him from a slightly more infamous portrait of the royals). The whole look borders on overwhelming, but it's such a good match to its wearer, I can't help but love it. 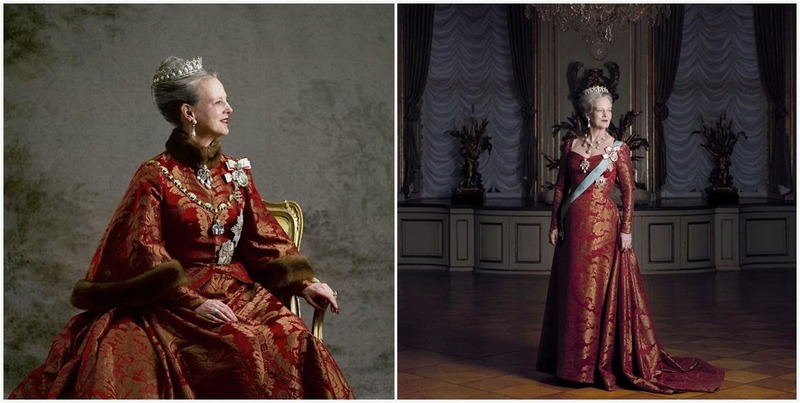 The Queen mentions in Dronningens Kjoler by Katia Johansen that this dress could someday replace the blue court dress with fur trim she's been using for the daytime New Year's Courts for so many years, and I, for one, can't wait for that day to arrive.